I've used Calengoo since its inception and the app has expanded significantly since its inception, particularly in how it accommodates non-google providers, Evernote, Google Drive, Waze, Weather, and more. This app has an enormous amount of customization available that will accommodate nearly any use case from a technical perspective or simply changing fonts and colors. With that said, customizing can be confusing at times when I’m unsure about the function or definition of a particular setting or the reason for its existence. but more options are better than less. My advise is to periodically backup your settings before making changes in the event you need to revert. Calengoo's out of the box settings work well but the colors are bright and not particularly pleasing to my eye. IMO the app would show better in the store with a more muted color scheme. The developer has continuously improved the app and is very responsive. Beyond the initial purchase he's never asked users for another dime in spite of the enhancements. I suspect App Store sales have somewhat matured and would support a subscription model if this was needed to ensure the apps long-term sustainability and continued development. I’m extremely confused why this app doesn’t have a perfect five star overall rating. I have to access four different people’s Google calendars plus outlook. On three different iOS devises. I can look at all calendars at once or I can choose to turn on and off each individually. Takes a fraction of a sec . 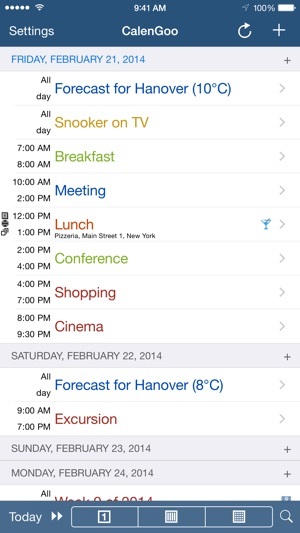 I can even choose which sub calendars in each persons Google calendar i see. This app can be used as it comes or you can customize virtually every component. There are hundreds of modifications you can choose to make. But you don't have to. When I can’t remember how to do something I can just look at the users manual on the Calengoo website. It’s syncs seamlessly and virtually simultaneously when I make changes in Google calendar on my desktop. And the technical assistance is fabulous. I haven’t had to asked for help in quite a while but when I did, I got a reply and a solution. end user error Lol. Definitely well worth the cost. Support staff is responsive and awesome. 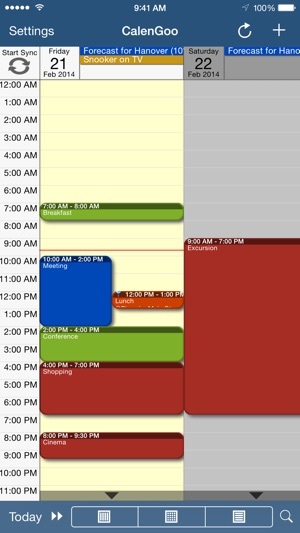 Each calendar and activity is just the unique color I want. Any time I have something I don't like, it's user error and they are happy to help me. I love that I have form and beauty here. 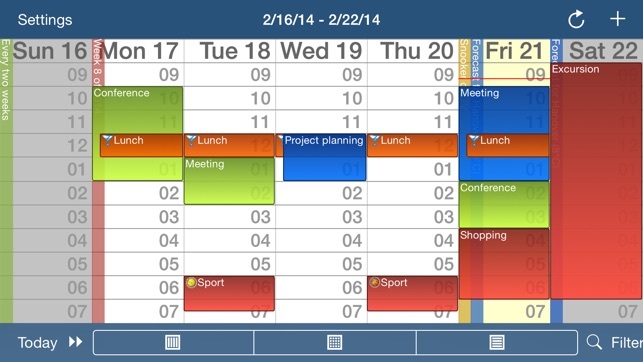 Some apps take away the words on the monthly calendar and replace with colorful bars... Or some other useless thing. 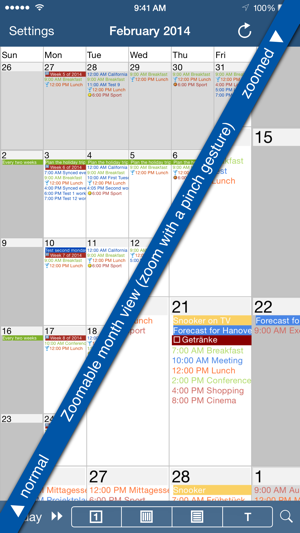 With this one, I can go to month view and still see all my events. It looks good and works great! It syncs perfectly. It works great with google (including matching to my 8 calendar colors) and does all that google tasks can do (and a little more, like put all overdue tasks on today, and view multiple task folders). 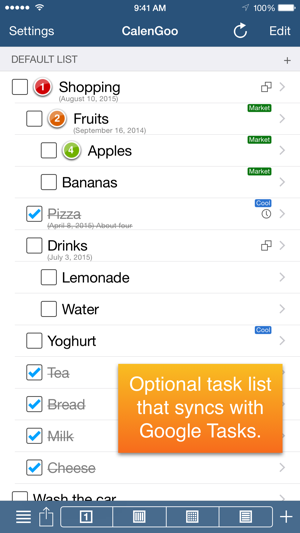 The new floating task feature has changed the way I do my GTD system and I can check off when I have completed events. This app has been my calendar app of choice for 5 years.... By far the app that has lived longest on my phone. (I shop and upgrade a lot.) It is interesting how this app used to be one of a kind, and now there are a few copycats, but this one still seems to have the most features that are integrated the best. Best part: I'm always finding new fun features to get more out of it! I regularly check out the expert options and always find new things to get out of the calendar.